It’s easy to get disoriented in a new place, and even easier to rely on GPS to get you from point A to B. With Archie’s Press letterpress maps, you can learn the layout of an entire city in a simple, holistic way. For centuries, people have had to learn new areas by memorizing landmarks. Now we just pull out our phones and follow the directions, no brain function required. New research indicates that GPS hinders our ability to create our own mental maps, and that we learn less about our surroundings. Founder Archie Archambault hand-designs beautifully minimalistic city maps. Using simple circles, he depicts relative landmark sizes and distance. Archie intends to give a well-rounded, uncomplicated image of a city the way locals understand it, showing not only notable places but neighborhoods and districts as well. Each map is created by hand on a printing press. Ideal for people exploring a new city, these maps can also make a beautiful keepsake from the cities you’ve visited or called home. Hello! 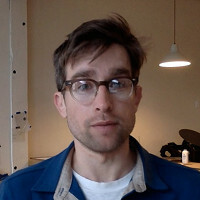 Archie here, ready to answer any questions about my work. 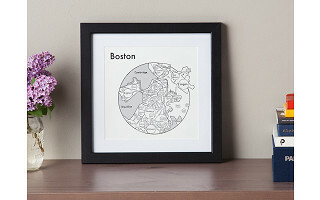 I love these maps and just purchased a Boston one to give as a gift to a recent transplant! At the Grommet office, during product testing, I saw the print of San Fransisco right before I took a trip there. It was spot on and really helped me wrap my head around the neighborhoods in relation to each other. How do you figure out these complex city orientations? Do you go there yourself and map it? Call on locals? Thanks! @Alison Hi Allison! I visit each city to experience it in the most thorough way possible. I always stay with locals who are excited about the project to help me decode the major gestures. You could say that I "collaborate" with the city itself to get the final product. Thanks for asking! Not sure if you got my other message but you've got to come up to Montreal, Archie, and stay at my Zen temple/airbnb home to explore the city! Really need a Montreal City Map...and then on to Paris! @Myokyo Judith Hi there! I'm currently working on a Paris map and will get to Montreal soon! My last name is Archambault and we are a very Québécois family! Archie, do you, or can you, produce your work in larger formats? @Dave Hi Dave, although I do make larger prints, they are currently not available on the Grommet. Thanks for asking! Love this idea Archie. I would appreciate seeing these prints of cities where military training & command facilities and the like are located such as Great Lakes, IL or Pensacola, FL for example. These prints would not only serve our military personnel well in their new station but be a great art pieces to collect over the years and gift. It's a huge market that would greatly appreciate it. Thank you for your attention and best of luck. @Susan Hi Susan! Thanks so much for the note, I'll definitely consider these places as I move forward with the project. That is really a smart idea! All my best. All of this success sounds like you need to train a ton of others to hit the road and continue your mapping! I'd love to see one for the DFW area. I get lost really easily because map books can be difficult to navigate and a GPS isn't always accurate. @Sophia It's definitely on the list!!!! Thanks for asking! Love this idea Archie. Are you doing any in Europe? Specifically Florence, Rome, Venice, Paris? They would be great mementos of vacations!!! @Judi Hi Judi! Thanks for asking. I have yet to visit Italy, but Paris is currently in the works! Thanks for reaching out. Hi ... Great maps..... BUT is there anyway to see them larger so I can see the details??? Hi Roz, if you click on the 'buy' button below the video, you'll be brought to a page where you can view each individual map in a larger size! I need a print of Boise, Idaho. Do you have one with the important places/events? @mary Hi Mary! Boise is on the list for sure! Thanks for asking! Does the moon print come with a frame? @mary Hi Mary! Unfortunately it does not come with a frame but fits any 8"x8" frame. Thanks! It’s easy to get disoriented in a new place, and even easier to rely on GPS to get you from point A to B. With Archie’s Press letterpress maps, you can learn the layout of an entire city in a simple, holistic way. For centuries, people have had to learn new areas by memorizing landmarks. Now we just pull out our phones and follow the directions, no brain function required. New research indicates that GPS hinders our ability to create our own mental maps, and that we learn less about our surroundings. 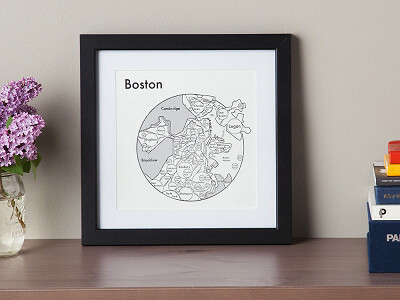 Founder Archie Archambault hand-designs beautifully minimalistic city maps. Using simple circles, he depicts relative landmark sizes and distance. Archie intends to give a well-rounded, uncomplicated image of a city the way locals understand it, showing not only notable places but neighborhoods and districts as well.